If the trades, made out of the powerful chief investment office unit in London, had been properly valued, the bank said it would have lost $1.4 billion on the position in the first quarter. Since announcing the multibillion-dollar mistake, JPMorgan has lost $25 billion in market value. Jamie Dimon finally admitting what we already knew but still not admitting that the real losses for the bank is closer to $30 billion. He is either the most incompetent CEO or he thinks that we’re all stupid to realize he knew about tis all along. The perp’s figured they were too big to indict and the Justice Department agreed. And this is why Richard Diamond and Jamie Dimon have nothing to worry about and the world is still being screwed. Financial Fraud Enforcement Task Force is the umbrella group for the RMBS (Residential Mortgage-Backed Security) Task Force. Remember that task force that was so gleefully announced by President Obama in his State of the Union address in January, appointing New York State Attorney General Eric Schneiderman to participate? Yeah, that one. It’s been under the radar for the most part and as yet has inadequate staff no office space or even a phone number. Like every one else who is following the refusal of the Obama Administration and its cowardly prosecutors to investigate Wall Street for crimes in the run-up to the Great Crash, I figured this was just a name given to a collection of prosecutors around the country who were already working on fraud cases. I’ve gone back through February looking at the press releases, and this is a fair sample of the work of the FFETF. There is not a single case related to fraud in the creation, sale or operation of real estate mortgage-backed securities, the frauds that led to the Great Crash. The FFETF is a random collection of people working on cases that can be tied to financial fraud. The FFETF and its 20 subpoenas and its 50 or more personnel and whatever else we hear from them are a sham. Wall Street has nothing to fear from the FFETF and its co-chair, Eric Schneiderman. But there’s no evidence that Mr. Holder’s Justice Department has mounted a serious effort to investigate bank crime. Its first, much-touted “coordinated effort” to crack down on mortgage fraud turned out to be a PR trick, not a law enforcement effort, which the Columbia Journalism Review described with the headline, “The Obama Administration’s Financial-Fraud Stunt Backfires.” That’s not the kind of press a President wants to see repeated in an election year. Without criminal investigations and indictments, bankers will continue to commit crimes. The LIBOR scandal, which implicates a number of leading banks, proves that. The Justice Department’s inaction is putting the world economy at risk by allowing bankers to continue their reckless and illegal behavior. Geithner passed the documents around to anyone who wanted them last night. If there can be something less than the bare minimum, a two-page document to the Bank of England – not the banks implicated in the rate-rigging over which the NY Fed has control, but some other regulator – would be it. He didn’t speak out publicly, he didn’t use his regulatory power over the banks he had authority and in defense of the stateside financial products calculated using the Libor benchmark rate, he just wrote a memo. The memo says that the Bank of England should “eliminate the incentive to misreport” Libor on the part of the banks. So there’s no doubt in the minds of the regulators that there was misreporting going on. The Federal Reserve Bank of New York will release on Friday documents showing it took “prompt action” four years ago to highlight problems with the benchmark interest rate known as Libor and to press for reform, an official at the regional U.S. central bank said on Wednesday. Well, Timmy did send a memo. Start gun-running and other black market activities up. European gun-running currently goes through Albania. Greece has much better ports. If the Euros don’t like it, they can militarize Greece’s borders at a cost much higher than feeding the Greeks. Become a full on black-hole for banking. If anyone wants to store money in Greece, they can. No questions asked, no forms needed. Make deals with other “pariah” and semi-pariah nations. Start with Iran and Russia for oil (Iran will be happy to give oil in exchange for black market help). Make a deal with various 2nd world nations for food, start with Argentina, they have no reason to love the IMF or the European Union, which promised to “punish” them for nationalizing oil in Argentina. In exchange Greece can offer use of their fleet, for cheap, and port rights for the Russian navy. They’ve wanted a true warm water port for some time. Offer them a nice island in the Med with a 30 year lease. For years, law enforcement officers and smugglers have played cat and mouse in Europe, where contraband cigarettes are stashed in everything from furniture shipments to loads of Christmas trees. But Europe’s four-year-old economic crisis is expanding the black market for cigarettes, robbing European Union nations of valuable revenue and drawing in a new class of smugglers. Hard facts about this smuggling trade are found in the lowliest places: the garbage. In annual surveys, financed by cigarette companies, researchers fan out to major cities in 27 European nations and collect crumpled cigarette packs. In turn those packs are analyzed by laboratories to determine how many are bought across the counter and how many are counterfeit. Some boxes are so meticulously produced in China, Dubai or Eastern Europe that they contain bogus tax stamps for different nations. The latest results of the garbage scavenging showed the black market competition had increased to record levels. In Spain, illicit sales last year soared 300 percent to more than 4.6 billion cigarettes. In the struggling region of Andalusia, they showed, contraband cigarettes commanded 20 percent of the market. In Ireland, smugglers are robust competitors with legal cigarette companies, reaching more than 17 percent. Over all, black market cigarettes continued a steady climb for the fifth straight year, topping 10 percent of consumption or 65 billion cigarettes, according to the annual report issued in June by KPMG for Philip Morris International. Paul Krugman: Who’s Very Important? “Is there a V.I.P. entrance? We are V.I.P.” That remark, by a donor waiting to get in to one of Mitt Romney’s recent fund-raisers in the Hamptons, pretty much sums up the attitude of America’s wealthy elite. Mr. Romney’s base – never mind the top 1 percent, we’re talking about the top 0.01 percent or higher – is composed of very self-important people. Specifically, these are people who believe that they are, as another Romney donor put it, “the engine of the economy”; they should be cherished, and the taxes they pay, which are already at an 80-year low, should be cut even further. Unfortunately, said yet another donor, the “common person” – for example, the “nails ladies” – just doesn’t get it. As Spain’s prime minister announced deep austerity cuts Wednesday in order to secure funds from the European Union to bail out Spain’s failing banks, the people of Spain have taken to the streets once again for what they call “Real Democracy Now.” This comes a week after the government announced it was launching a criminal investigation into the former CEO of Spain’s fourth-largest bank, Bankia. Rodrigo Rato is no small fish: Before running Bankia he was head of the International Monetary Fund. What the U.S. media don’t tell you is that this official government investigation was initiated by grass-roots action. But if such troubles lie ahead, the real cause will not be spending on income security, health care, infrastructure, education or any of the other programs that have made America a great nation. If we are driven toward national bankruptcy someday, the likeliest cause will be our failure to raise and enforce taxes on those who can afford to pay-because we, too, have encouraged a culture of evasion rather than responsibility. An article in the current issue of Rolling Stone chronicles “The Fallen: TheSharp, Sudden Decline of America’s Middle Class” and describes a handful of middle class men and women made homeless, forced to live out of their cars in church parking lots in Southern California. “Too much money” sounds like an oxymoron, especially when applied to American politics. But in the last week, Republicans are beginning to learn that lots of money can have its downside. Thursday’s story that Romney may have actively directed Bain Capital three years longer than he claimed – a period in which Bain Capital-managed companies experienced bankruptcies and layoffs – caps what must be the worst weekly news cycle of any modern American presidential candidate. From images of corporate raiding, to luxury speedboats, to offshore accounts in the Cayman Islands, to mega-mansions in the Hamptons, this week’s stories suggest that the candidacy of Mitt Romney – poster-boy for the symbiotic relationship between big money and the modern Republican party – is in serious trouble. Taking the hint, the Obama administration is finally positioning itself on the firmly on the side of progressives, attacking income inequality and holding Republicans accountable for their assaults on the middle and working classes. How ironic it would be if, after all, the other side’s big money is the answer to the Democrats’ prayers. On this day in 1930, the first two World Cup matches took place simultaneously on 13 July and were won by France and USA, who defeated Mexico 4-1 and Belgium 3-0 respectively. The first goal in World Cup history was scored by Lucien Laurent of France. In the final, Uruguay defeated Argentina 4-2 in front of a crowd of 93,000 people in Montevideo, and in doing so became the first nation to win the World Cup. The world’s first international football match was a challenge match played in Glasgow in 1872 between Scotland and England, which ended in a 0-0 draw. The first international tournament, the inaugural edition of the British Home Championship, took place in 1884. At this stage the sport was rarely played outside the United Kingdom. As football grew in popularity in other parts of the world at the turn of the 20th century, it was held as a demonstration sport with no medals awarded at the 1900 and 1904 Summer Olympics (however, the IOC has retroactively upgraded their status to official events), and at the 1906 Intercalated Games. At the 1908 Summer Olympics in London, football became an official competition. Planned by The Football Association (FA), England’s football governing body, the event was for amateur players only and was regarded suspiciously as a show rather than a competition. Great Britain (represented by the England national amateur football team) won the gold medals. They repeated the feat in 1912 in Stockholm, where the tournament was organised by the Swedish Football Association. With the Olympic event continuing to be contested only between amateur teams, Sir Thomas Lipton organised the Sir Thomas Lipton Trophy tournament in Turin in 1909. The Lipton tournament was a championship between individual clubs (not national teams) from different nations, each one of which represented an entire nation. 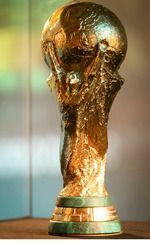 The competition is sometimes described as The First World Cup, and featured the most prestigious professional club sides from Italy, Germany and Switzerland, but the FA of England refused to be associated with the competition and declined the offer to send a professional team. Lipton invited West Auckland, an amateur side from County Durham, to represent England instead. West Auckland won the tournament and returned in 1911 to successfully defend their title. They were given the trophy to keep forever, as per the rules of the competition. In 1914, FIFA agreed to recognise the Olympic tournament as a “world football championship for amateurs”, and took responsibility for managing the event. This paved the way for the world’s first intercontinental football competition, at the 1920 Summer Olympics, contested by Egypt and thirteen European teams, and won by Belgium. Uruguay won the next two Olympic football tournaments in 1924 and 1928. Those were also the first two open world championships, as 1924 was the start of FIFA’s professional era. Due to the success of the Olympic football tournaments, FIFA, with President Jules Rimet the driving force, again started looking at staging its own international tournament outside of the Olympics. On 28 May 1928, the FIFA Congress in Amsterdam decided to stage a world championship itself. With Uruguay now two-time official football world champions and to celebrate their centenary of independence in 1930, FIFA named Uruguay as the host country of the inaugural World Cup tournament. You see, it’s not just the 1:26. You can think of scenarios where you could make that time back. Nope, it’s the fact that you now need 3 buses and Cadel Evans has demonstrated that he’s not even close to finding a solution to any of the other contenders. Yes, we have Medium Mountains today. Two category 1s and a category 3 with the Award point after the two category one climbs. However much the commentators and organizers may wish it however, it doesn’t seem like that’s any kind of advantage for Evans. He can’t out climb, out sprint, or out trial them, what exactly is he supposed to do? Mark Renshaw, Bauke Mollema, Rob Ruijgh, Gustav Larsson, and Lieuwe Westra had to withdraw yesterday, Fabian Cancellara did not start so he could visit his wife and newborn. Alessandro Petacchi and Yuriy Krivtsov were outside the time limit. Jean-François Pescheux, the official site analyst, thinks that many more Sprinters will be forced out today. Coverage is customarily on Vs. (NBC Sports) starting at 6:30 am with repeats at noon, 2:30 pm, 8 pm, and midnight. There will be some streaming evidently, but not all of it is free. Our idiot ‘Masters of the Universe’ who can’t even make money on carry trades at 0% borrowing costs are soon going to learn that 10%+ return on investment is not part of the Constitution or Bill of Rights. For almost three years, no matter what has rattled the financial markets – a debt crisis in Europe, high gasoline prices, a slower economy – investors have been soothed by rising corporate profits. Over recent weeks, a motley collection of chain stores, steel producers and technology titans have warned of slowing profits. They all point to similar culprits – flagging sales to Europe and slower economic growth in China. The list of companies that have warned of trouble is long and varied, and includes well-known names such as McDonald’s, Cisco, Starbucks and Tiffany & Co.
Add them up, and 94 companies have lowered their estimates for this earnings season, which begins on Monday when Alcoa, the aluminum maker, reports its results. Only 26 have raised their estimates. Morgan Stanley’s research team says the ratio hasn’t been that lopsided toward the negative since the summer of 2001, when the economy was in the middle of an eight-month recession brought on by the bursting of a bubble in technology stocks. Wall Street stocks slid for a sixth consecutive day on Thursday as concern spread that weaker global economic growth and the European debt crisis would hurt American corporate earnings. The Standard & Poor’s 500-stock index was headed for its longest losing streak since mid-May. Aluminum maker Alcoa, which started the second-quarter earnings season on Monday, reported weak revenue because of the faltering global economy. Fastenal, an American industrial distributor, reported revenue Thursday that was weaker than analysts had expected. Marriott, the hotel operator, and Progressive, an insurance company, both fell after reporting weak financial results. Supervalu, the supermarket operator, plunged by nearly half after it reported a sharp drop in net income late Wednesday and suspended its dividend. The company owns Albertsons, Jewel-Osco and Save-A-Lot. Supervalu’s losses dragged on a rival grocery chain, Safeway, which fell 10.5 percent. Safeway’s was the biggest percentage decline in the S.&P. 500 index. The weak corporate results will probably lead analysts to lower their quarterly earnings forecasts for the entire S.&P. 500, said John Fox, a co-manager of the FAM Value Fund, which specializes in small and medium-sized companies. New numbers to be released on Friday are expected to show that China’s growth in the second quarter fell to 7.3 percent from the previous quarter’s 8.1 percent, which was a three-year low. Revenue from the construction, shipbuilding and export manufacturing industries might have been cut in half since last year. Because LIBOR Investor Fraud is so yesterday. The money laundering, which a U.S. Senate subcommittee indicates was linked to terrorism and drug deals, could result in HSBC’s paying fines of up to $1 billion, according to analysts. Adding another political wrinkle: HSBC’s former chairman, Stephen Green, who was in office from 2006 to 2010 when many of the money-laundering detection problems occurred, is currently the trade minister in British prime minister David Cameron’s government. Mr. Green’s office did not reply to a request for comment on Thursday. HSBC is to apologise to US lawmakers for failing to have appropriate controls in place to ensure it did not facilitate the financing of terrorism and other criminal activities, transgressions that analysts estimate may cost it up to $1bn in fines. Mr Gulliver warned that HSBC was likely to face further action from other US authorities in coming months. HSBC said in its 2011 annual report that fines relating to money laundering issues could be “significant”. There has been speculation among analysts that the bank could be hit with a higher charge than the $619m ING, the Dutch bank, agreed to pay to settle accusations it violated US sanctions by helping Iranian and Cuban companies move billions of dollars through the US financial system. Some have suggested it could be as much as $1bn. Last month ING, the Dutch bank, paid $619m to settle accusations it helped Iranian and Cuban companies move billions of dollars through the US financial system in violation of US sanctions. Some analysts have suggested HSBC’s fine could be far higher. He said that while the view might not be fair, the JP Morgan scandal, Libor and now HSBC meant it was a theme that was likely to be developed. “We like to blame someone else,” he said.